If you are thinking about starting your own construction business, there are some common pieces of machinery that you might not have been aware of. 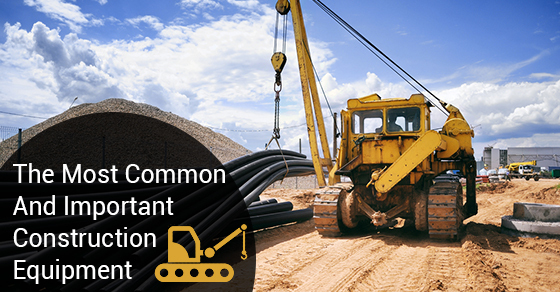 They each come with their own construction equipment financing needs, and they could end up proving integral to the success of your business. Below is your guide to some of them. These large pieces of common equipment are either on wheel or on tracks, and usually have a long bucket arm attached to a pivoting cab, which is capable of rotating 30 degrees. The operator of the excavator sits in the cab and controls the machine from there. They are most commonly used for digging application, but also for lifting heavy prefab pieces like pipe, as well as other smaller pieces of equipment. These are some of the strongest, as well as the most reliable pieces of heavy machinery in the construction industry, and as such, are also some of the most common machinery for which people apply for construction equipment financing. It is used to move dirt and other materials along large tracts of land. They typically have a wide, flat blade at the front, used for digging into the earth that is controlled by hydraulic pistons. The weight of the bulldozer can also be used to crush rocks and other debris. These are some of the most versatile pieces of heavy machinery available in the construction industry, and as such, are another one of the most common things for which company owners typically want construction equipment financing. The skid-steer loaders can actually turn within their own footprint, meaning they are incredibly mobile and work great in small, confined spaces. Their tread system is also designed to minimize the impact that they have on areas that are already finished (landscaped gardens, etc.). These pieces of heavy machinery are used to fine grade and move around small amounts of dirt. They are most commonly seen fine grading dirt, or gravel roads, or preparing the base course below the first layer of asphalt. They can also be used to create sloped surfaces, or drainage ditches with shallow, V-shaped cross sections. Regardless of the machinery you need, you can get construction equipment financing for all of the above. If you are thinking about starting your own construction company and are wondering what some of your equipment needs are going to be, or could potentially be, given what you want to do, keep the above four in mind.